Whether I believe it solely for my sanity or because there are strong theories suggesting it, there can be no way that Jon Snow is dead dead on Game of Thrones, despite what actor Kit Harington says. With so much evidence stacked up to make it seem like Jon Snow will return, it appears the beautiful Kit Harington is lying to fans of Game of Thrones when he says he won't be back to the HBO show. And, while I don't want Harington to sue me for libel (although, it would get me closer to him...), the Jon Snow actor has set a precedent for not always telling the public the truth. 1. When He Called His Hair "Pretty Horrible"
To be fair, he was explaining to GQ how he wouldn't wash his hair for six weeks while he was filming to get his famous looks to look "greasy and medieval." 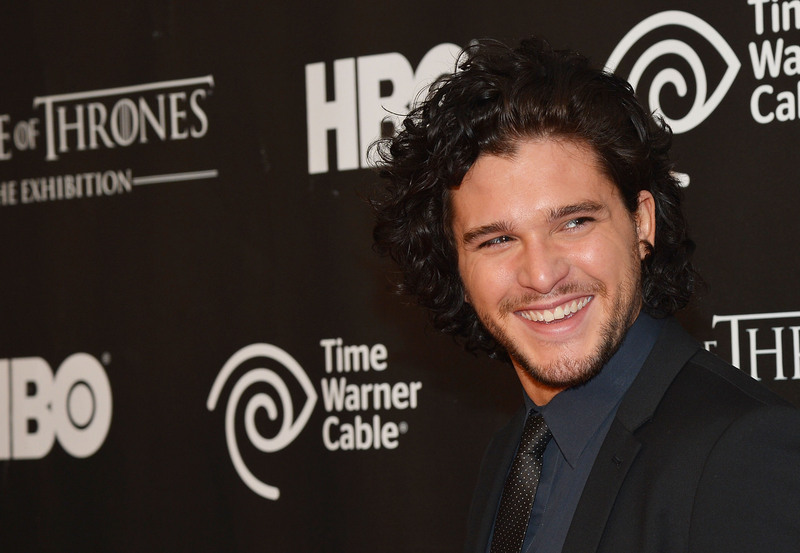 But, every Harington fan knows his hair could never look any sort of "horrible." His hair is a big point of contention for Harington. Sansa actress Sophie Turner said that Harington was obsessed with his locks and admires his curls in the mirror. When Vulture asked him about Turner's comments, he laughingly said, "The girl is lying." Maybe she was, maybe she wasn't. Either way, let's take a moment to imagine Harington coiffing those curls in the mirror. In that article with Entertainment Weekly where he said he wouldn't be returning for Season 6, EW asked if he was given any parting gifts after he finished shooting his last scene. Harington replied, "No! Rose [Leslie, who portrayed Jon's love interest Ygritte] got a f**king bow and arrow and I didn’t get s**t! So yeah, I’m definitely less popular than Rose." I love me some Rose Leslie, but I sincerely doubt that he isn't equal to her popularity. Plus, perhaps the lack of parting gift means he isn't actually done on the show?? Harington was asked on HuffPost Live if he could make the same tough decisions as Jon Snow (like not going along with Stannis to become Jon Stark) and he responded with, "Jon's actually a lot wiser than me in many ways." Well, Harington, considering you're alive, I think you may have more street smarts than the beloved Jon Snow. So Harington, you obviously know something more than Jon Snow... and that's definitely a good thing. Now, let's just hope you're not telling the truth about your show fate. It's a lie we would totally forgive you for.